The Freestyle Cruiser™ from FreeStyle Slides is the world’s first custom made, sealed-air inflatable water slide for the yacht industry. At FreeStyle Slides our vision for cutting edge family entertainment has led to the development of some of the most unique inflatable slides in the world. 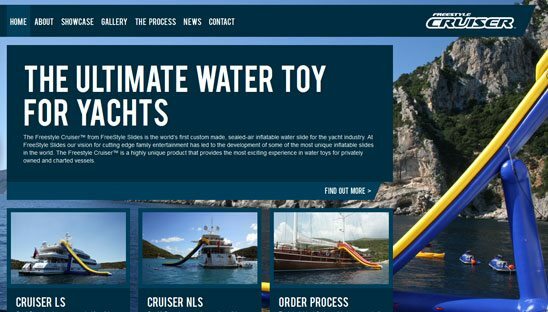 The Freestyle Cruiser™ is a highly unique product that provides the most exciting experience in water toys for privately owned and charted vessels. Freestyle Cruiser hired us for the full social media design package, which includes: Custom WordPress website design, Facebook design, Twitter design and Youtube Design. This is a very advanced coded wordpress site using tons of custom fields. As you will see, we tried to incorporate a new image and view of the inflatable yacht slide on background of each page. Site also includes a blog, showcase section, photo gallery, social network icons, contact form, order process, twitter feed and much much more. Using the same wordpress, we built a custom CMS iframe Facebook tab. This tab showcases a photo slide show, information on the slide, recent blog feed, recent tweet and more. The custom twitter and YouTube background is based on the same branding.